The report “Waste Paper Management Market by Service & Equipment (Collection & Transportation, Recycling, Incineration, Disposal), Recovery (Containerboard, Newsprint, Tissue), Source (Commercial, Industrial, Residential), Paper Grade - Global Forecast to 2020”, defines and segments the waste paper management market, along with analyses and projections of the market size. It also identifies the driving and restraining factors in the waste paper management market with the analysis of trends and opportunities. The global waste paper management market is projected to be valued at around USD 43.35 Billion by 2020, and to grow at a CAGR of 2.55% from 2015 to 2020. Recovered products of waste paper recycling include container boards, paper & paperboard, newsprint, tissue, and pulp substitute. Increasing population, strict regulations imposed by local governments for waste management practices, increasing consumer awareness, and increasing awareness about environmental safety are the main drivers of the waste paper management market. 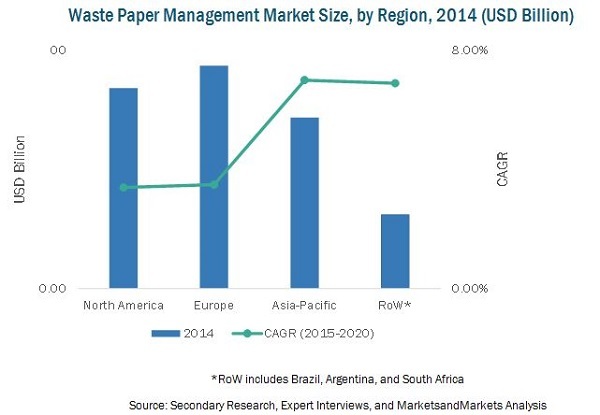 The waste paper management market is expected to witness significant growth in the future with the increasing popularity of sustainable waste management practices. The market is also projected to experience growing demand in the industrial as well as commercial sectors. Developing markets such as China, Brazil, and India are emerging as growth economies for waste paper management market. Growing economies, increasing population, and the resultant disposable income of people are acting as the main drivers for increased opportunities in these countries. The presence of better waste treatment facilities has been a factor in contributing to the rising demand of waste paper management services in the mature regions of Europe and North America. The growing interest of consumers regarding environmental safety is also a key driver of waste paper management market. The leading players in the market include Veolia Environnement S.A. (France), International Paper Company (U.S.), Waste Management, Inc. (U.S.), UPM-Kymmene OYJ (Finland), and WestRock Company (U.S.). Other players include Republic Services Inc. (U.S.), Mondi Group (South Africa), Georgia-Pacific LLC (U.S.), Sappi Ltd. (South Africa) and DS Smith Plc. (U.K.). Companies are adopting inorganic growth strategies such as acquisitions, new product developments, mergers, and expansions to cope with the increasing demand for sustainable waste management practice labels in key emerging markets. These strategies have helped companies to create a large customer and partner base in key markets.